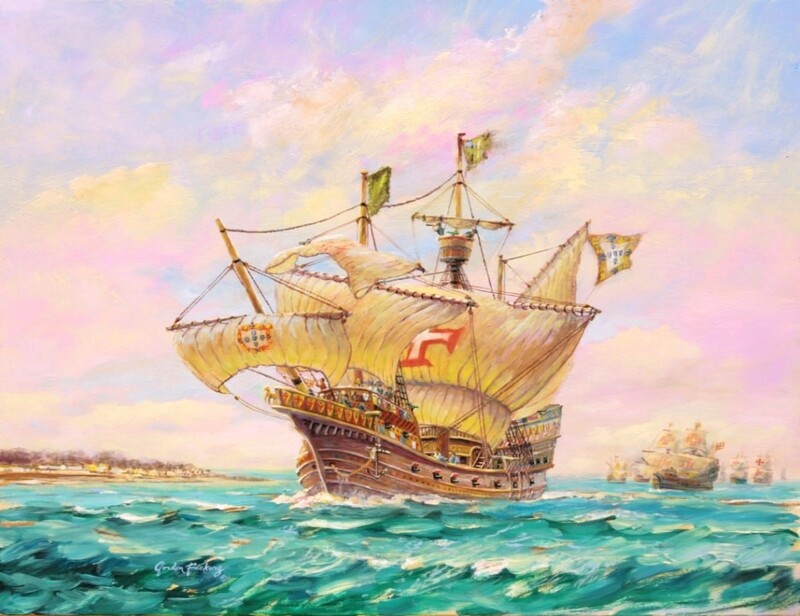 Portuguese carrack fleet entering the Gironde, Bordeaux estuary. Painting measures 48 x 61 cm (19″ x 24″), oils. Price £1,800., ex studio, ex frame. Looking for the best, looking for a bargain? You have found one here. How much is that in my currency? ~ Try this free XE Personal Currency Assistant. You can use Paypal on our Payment page or contact us to arrange bank to bank payment.By arrangement payment can be made in easy stages, own an original ‘Gordon Frickers’, ask for details. Carefully researched, this spirited painting is correct right down to the flags and the herald with trumpet. 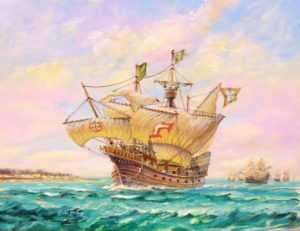 In days gone by huge fleets arrived to collect the fine wines of Bordeaux, wines still shipped to every European port, probably every European city and are increasingly, world wide. Adding to the investment value of this painting, “The Coming of the Cross”, the book cover will be illustrated by this painting. Following the success of “The Corsair”, now a best seller in Arabic and English (ISBN 978-99921-94-72-0) the publishers have asked to use the same artist for the whole series, that’s me folks !. Email note, please use @: artistfrickers at gmail.com ~ NOTE: we us ‘at’ not @ to stop robots stealing the address.